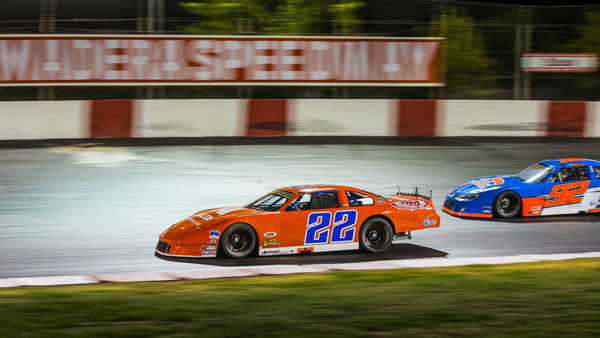 UKIAH, CALIFORNIA (July 29, 2017) - Reno's Randy Hedrick became the sixth different winner in as many races as he scored the victory in Saturday night's 75 lapper at Ukiah Speedway for the Pacific Challenge Series presented by PenneyLawyers.com The 2017 series has competed at five different race tracks with no clear cut favorite as the championship has just three races remaining. Hedrick's win came in large part due to late race theatrics involving the lead cars on the tight quarter-mile bullring at the Redwood Empire Fairgrounds. Hedrick assumed the lead on lap 64 and held off a charge from points leader and 2015 champion John Moore of Granite Bay, CA for the win. Not only was Hedrick the sixth different winner but he was the fifth first-time series winner with John Moore's July win at Stockton the only win this year by a driver with a victory under his belt. Cole Moore set the Sunoco Fuels Fast Time with a 12.575 second lap and followed that up with the American Racer Tire Dash win for a set tires to earn the pole for the feature. 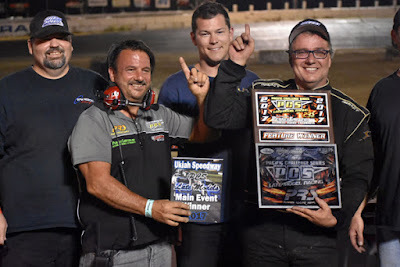 Moore paced Modesto's Mike Beeler, the 2014 series champion, throughout a strong 56 lap green flag run that saw the duo stretch out a nearly half lap lead on third place Matt Wendt of Galt. Grass Valley's Austin Gant drifted back to fifth under the run after running as high as third. The caution flew for John Dalerio stalling his Dodge while trying to exit the speedway. Moore was overhauled by Beeler on the restart and eventually dropped to sixth with a tire going down. A caution on lap 63 allowed Moore to pit and rejoin the race. The ensuing attempts at a restart proved to be the boiling point as John Moore and Beeler failed for a successful restart twice and were subsequently put back to the second row by series officials. Hedrick and Wendt assumed the front row with Hedrick taking over the lead and Beeler snaking into second. Beeler closed within .327 seconds of Hedrick at the stripe with Wendt third ahead of John Moore and Myles Anderson. Gant finished sixth with Cole Moore one lap in arrears in seventh. The championship fight now sees John Moore leading Mike Beeler by ten markers with Cole Moore's hopes fading to a 30 point deficit. Matt Wendt and eighth-finishing Jack Wood round out the top-five. Wood continues to be the leading rookie in the series for 2017 as well. The Pacific Challenge Series presented by PenneyLawyers.com continues August 12th with their second visit of the year to the fast-paced Madera Speedway in Madera, CA.